This year is much better, especially for Leo as he now has a much better level of understanding and can cope with a later bedtime so most days, if he had been good he gets to stay up for Daddy to take him to bed. This has been working very well but recently he announced he was worried about Daddy, and worried he wouldn't be able to play until winter, So Aaron decided that during the holidays Sunday nights would be a special night for them as he finishes work a little earlier. The long hot summer - so far so good! We're over halfway through the summer season! I was worried when Aaron went back to work in April after 5 months off over the winter and it seemed like it would be a lifetime before we all had time together again - in Loukas case it pretty much would be anyway! It's not been easy but so far so good, in our case at home anyway. Aaron is exhausted bless him as he is right in the crazy period which will last through August but he's powering through. Leo has now been off school for a month and thanks to the amazing invention that is the Nintendo Wii it has largely been an enjoyable time. We've ticked off a few items off our Summer Dreams list and I have several more plans, some of which have been on hold as both my parents have been ill recently so we are still looking forward to a boat trip, funfair evening and some beach / pool trips together. 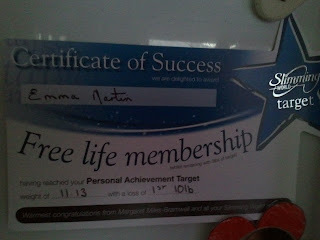 A belated Slimming World update! It has been four weeks since I wrote an update on how I am doing at Slimming World, that in itself is not strange as I never planned to do it regularly, what is strange is the fact that I reached target three weeks ago and haven't got round to mentioning it! I also haven't been back to group since then although that's only due to Leo being off school and it being too much like hard work to stay after weigh in with both the boys, being at target means I don't have to pay so from that point of view I don't need to go at the moment. I will go next week to weigh in to keep myself on track but probably won't end up staying again until after the summer holidays. Personally I'm not a fan of weighing and going, I've always liked to stay to the meetings, even if sometimes they can be hard work! Certainly in the winter when Aaron will be around to look after Louka I'll go back to staying every week. After 3 weeks I decided to ditch the 'photo a day' prompts, I had been enjoying them but after taking several random photos that I'd never normally put on here (including last weeks photo of an empty bouncy castle) I felt I was clutching at straws when I took a photo of a sandwich, and not even an interesting sandwich! I don't know if the prompts had put me off but since then I've really struggled taking a photo each day and really didn't fancy doing it but as I figured I usually end of taking at least one it seemed a shame to give it up so easily! Louka has been suffering from a very high temp for few days now which we think is due to teething so we've not been up to much, and therefore the photos were not the most interesting but I'm still going! Leo grudgingly watches as Louka takes over what he was doing! Only wanting to sleep on Mummy, despite me trying to explain it would be much cooler to sleep somewhere else! 14. Edible - it makes a change for him to be putting something in his mouth that actually is! 15. Outside the window - taken standing at my Mum's kitchen sink. 16. Bottle - holding it himself now! 17. Inspirational - We spent the afternoon at a friends house and Louka was so determined to get up this slide. He never gave up, and made it in the end. 18. Number - Puzzle time with Leo putting in the last piece of the Number 1 tank engine. 19. Building - Leo building a tunnel to go over the tracks. 20. Hot - you know it's hot when the bouncy castle is empty because it's too hot to stand on! Sometimes you've just got to get out! Everyone always says when you have kids its good to get out for a while everyday, today was one of those days! Despite going downstairs to our shared pool at 1pm for an hour I think the boys and I were suffering today. I spent most of the afternoon racking my brains for somewhere to go - it was 38 degrees which ruled out parks, walking and pretty much everything I could come up with. Eventually at 5pm everybody lost the plot - Leo was building tracks, Louka was demolishing them, I couldn't keep picking him up with my bad back which was playing up and everyone was generally hot and grumpy. As I had already made dinner (a pasta salad to eat cold) I packed it into a plastic box and announced we were going out! 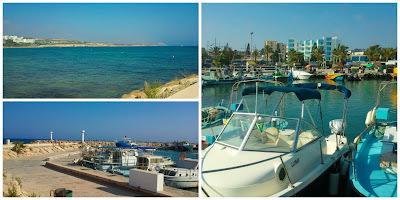 Thinking it would be a bit cooler than earlier in the day I put the kids in the car and headed down to Agia Napa for a stroll round the harbour and a picnic dinner by the sea. He's a Jingle Jangle baby. Three years ago, not long after we moved to Cyprus I started to take Leo to 'Jingle Jangles' a music group for 0-3 year olds, he was 9 months old and although at first he had no real idea what was going on it was good for him and even better for me! I was sad at our last session as it was one of the things that kept me sane when I first moved here, and the place where I met two people who I now count among my best friends. This month I got to relive some old memories when I took Louka for the final 3 sessions before the summer break. It was quite surreal to sit down again in the familar circle and 'tick tock' with a 9 month old on my lap again. It was a bit odd being there without the others but I knew a couple of them and of course I know 'Miss Claire'. Singing all the familiar songs it seemed like only yesterday I was there with Leo. 7. Where you are - this is where I often am, building tracks and playing trains! 8. Path - I wanted to go out and explore to find an interesting new path to take a pretty photo of, but it is far too hot! 11. I wore this - and probably have done every day since April! 12. Bad habit - biting my nails, I was just trying to distract from it a little by getting my rings in shot! 13. 4 o'clock - being used as a human climbing frame by Louka. As we recently saw the end of school for the summer I thought we'd start off as we mean to go on and I chose the first activity from our 'Summer Dreams' list. I provided the ingredients and Sam came armed with the decorations. 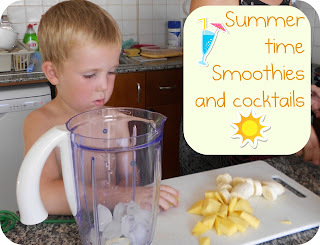 We started with a fruit smoothie, banana, mango, orange juice and ice. They enjoyed helping to make it, putting the chopped fruit into the blender and pressing the button. The smoothies were not a huge hit with the kids but we enjoyed them as I made the next round, a child friendly take on one of one of my all time favourites. I received two products form Stuck on You, although I have now committed the 'Mum of 2' sin of not getting the same products to save on arguments, thankfully Leo's gift is the better of the two (in his opinion) and Louka is too young to care! Leo is now the proud owner of a personalised height chart. The chart is made of good quality canvas and edged in wood. It's approx 400x1270mm. 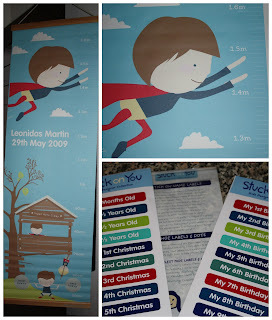 It also comes with a set of stickers to mark the child's height on special dates. Louka wasn't left out though, he now has a silicone placemat, very handy as I predict it will be some time before he stops making a hell of a mess at mealtimes! The placemat is a good size, approx 480 x 355mm and is easy to wipe clean or rinse under the tap. We crossed the first thing off our 'Summer Dreams' list by going to see a show by Perfomers Academy of Dance and Theatre arts. 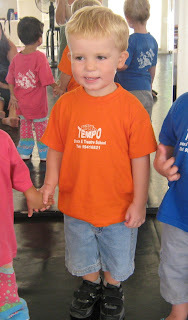 After being in his school show Leo was excited to go and watch one, it was quite hard work as he was a bit too short to see well so we kept changing positions, eventually sitting at the back on the floor in the aisle. He asked a million questions during it which was annoying but he really enjoyed it.